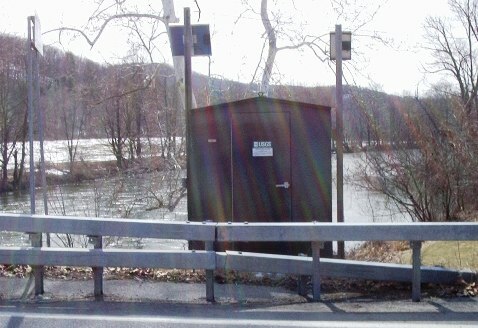 LOCATION.--Lat 43°06'31", long 73°25'18" referenced to North American Datum of 1983, Washington County, NY, Hydrologic Unit 02020003, on right bank downstream from bridge on County Highway 61, 1.8 mi downstream from Whitaker Brook, and 2.0 mi upstream from Trout Brook, at Battenville. PERIOD OF RECORD.--Occasional miscellaneous discharge measurements, water years 1908-10, September to December 1908 (gage heights only), October 1922 to September 1968, annual maximum only--1987-98, April 1998 to current year. October 1922 to October 2003, published as "Batten Kill at Battenville" (01329500). GAGE.--Water-stage recorder and crest-stage gage. Datum of gage is 373.10 ft above NGVD of 1929 and 372.59 ft above NAVD of 1988 (VERTCON). Prior to October 1922, nonrecording gages at site 0.25 mi upstream at different datum. October 1922 to Oct. 10, 2003, at site 0.75 mi downstream at datum 4.01 ft lower. REMARKS.--Regulation at low and medium flows prior to 1982. Water Years 2014-18: Records good except those for estimated daily discharges, which are poor. EXTREMES FOR PERIOD OF RECORD.--Maximum discharge, 21,300 ft³/s, Nov. 4, 1927, gage height, 17.7 ft, from floodmarks, site and datum then in use; minimum discharge, 7.3 ft³/s, Oct. 5, 1953 (result of regulation).